New players at FortuneJack Casino get to claim BTC 5 extra bonus. They can collect this amount via 4 deposit bonuses, with the first and the 4th one rewarding BTC 1.5, while the two in the middle giving away BTC 1 each. CVlaim BTC 5 at FortuneJack Casino! New players at FortuneJack Casino will be offered bonus money up to BTC 5. All new customers can apply for four deposit bonuses after registering. In addition, 25 no deposit free spins also come with a new account. Verify your phone number to get your free spins instantly. After that, make your first deposit and get 110% extra up to BTC 1.5. 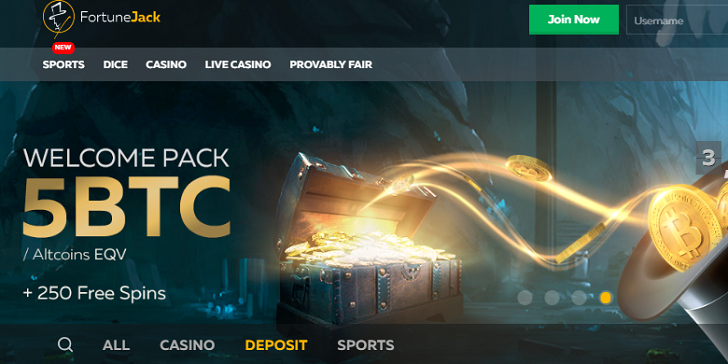 The Second and Third Deposit Bonuses at FortuneJack Casino reward you with 50% extra money up to BTC 1 each, while the Fourth Deposit Bonus offers 100% up to BTC 1.5. That’s a total of BTC 5 in your welcome package. The minimum deposit is BTC 0.002. You will face a 40 times wagering requirement before being able to withdraw.